Calendar links can be inserted for Outlook for Office 365, Outlook 2019, Outlook 2016, Outlook 2013 and Outlook 2010. Highlight the text you would like to add the Calendar to. Click the Insert Calendar Link icon on the right hand side of the Editor. 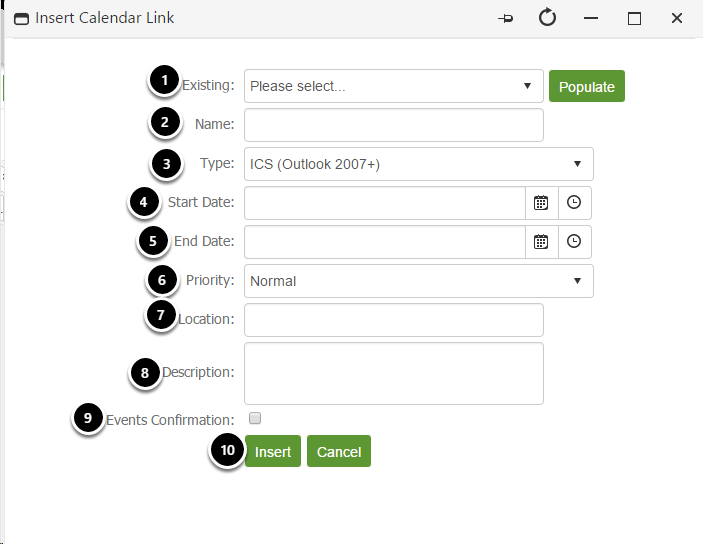 If it is an Event/Meeting that you have created previously then you can select it from the Existing drop down and the previous details will be pre-populated for you. Select the type of Calendar Link you would like to create. All Email Clients work differently and insist on different configurations for the link to work. Enter the start date and time of the Event/Meeting. Enter the End Date and time of the Event/Meeting. Enter the Priority of the Event/Meeting. Enter the Location of the Event/Meeting. Enter the Description of the Event/Meeting. If this is an Event Confirmation that you have created within the platform using the Event tool then you MUST tick this box or an error will occur. Once you are happy click insert to finish and insert the link.